To keep pace with the rapid developments in electronics, internal and external connection systems are naturally increasing in density. At the same time, labor requirements and overall costs must be minimized. RA connectors meet all of these requirements, while providing increased reliability. These connectors, whose materials, shapes, dimensions, and surface treatments have been carefully selected, are based on the latest technological information that has been accumulated and improved over years of experience in crimping connection technology. The twin U-slot is the most important IDC element in JST's RA connectors. As shown in the figure, wire conductors are connected between the slots of U-shaped parallel beams, and the distance between each adjacent pair of beams is designed to be one third of the pitch of wire strands. Two precision dies are used to blank and form the contacts. After the first die blanks the contacts, they are gold plated at crucial points. Then, the contacts are formed by the second die. This eliminates unnecessary gold-plating and overall costs are minimized. This innovation is another example of our industry-leading technology. Header posts are also selectively gold-plated. 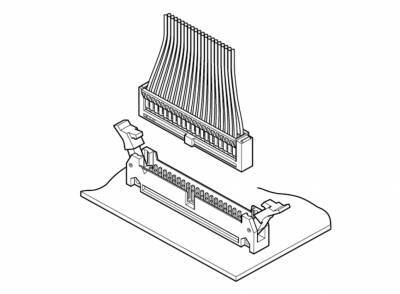 While square wire material is used for production of conventional posts in loose pieces, continuous flat strip is used for production of our post in chain form. This allows selective gold-plating and provides cost reduction. JST's unique technology allows it to produce connectors that are extremely reliable and cost-efficient. 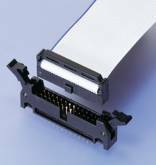 RA connectors fit commercially available 1.27mm (.050") pitch flat ribbon cables. A variety of ribbon cables are offered according to the purpose. Moreover, the RA series receptacles and header are interchangeable with the similar type of connectors commercially available. Contact JST before procuring cables and other manufacturer's mating connectors.